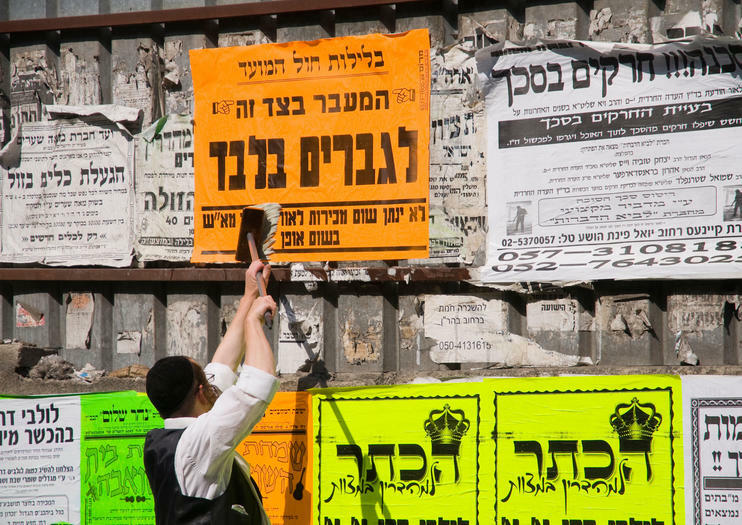 Having a predominantly Haredi and Hasidic population, the Orthodox Jewish neighborhood of Mea She’arim is a world of its own within Jerusalem. The insulated neighborhood is one of the oldest Jewish areas in the city and accordingly, life revolves around the many strict religious rules and traditions. Men can be seen wearing the traditional black frock coats with white shirts and stiff black hats to cover their heads. Women usually dress in black, long skirts and blouses and cover their heads with a headscarf or a wig. Additionally, the households in Mea She’arim reject most technology, including computers, televisions and radios as well as newspapers and magazines. Instead, important messages and news are glued onto walls or one of the numerous billboards that can be seen everywhere. Next to the messages, there are also the so called “modesty posters”, big notices with bold print that urge visitors to wear at least knee length clothing as well as tops with sleeves. Since the inhabitants of Mea She’arim also don’t want to become a major tourist attraction, photography is forbidden within the neighborhood and visitors are generally encouraged to blend in. The residents of Mea She’arim might be suspicious of strangers, but if you make the effort to follow the rules and blend in, you will find the people to be nothing but honest, helpful and friendly. Those looking for bargains and reasonable prices will discover a great selection of interesting goods in the shopping district and it is worthwhile to purchase typical Jewish necessities and clothes, visit one of the bookstores and follow the mouthwatering smells into one of the many bakeries. The bakeries could even be called the main attractions of the neighborhood, so make sure not to miss out on the Sufganiyah, delicious round jelly doughnuts topped with powdered sugar. The Mea She’arim neighborhood can be found outside the old city in the northern part of Jerusalem. Make sure to wear modest clothing when visiting and refrain from taking pictures.